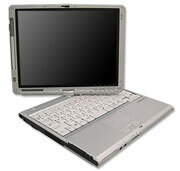 Along with the Fujitsu LifeBook FVM-T8140, Fujitsu has also announced this week the LifeBook FMV-T8240. It is based on Intel’s Santa Rosa platform, and unlike the T8140 which uses a Low Voltage CPU, it’s using an 1.8GHz Intel Core 2 Duo T7100. It also has a 12.1-inch non-widescreen display, which is kind of interesting. It weighs in at around 4.36 pounds starting (probably without DVD drive) and with an add-on battery it gets up to 11 hours of battery life, if you are running Windows XP (Vista – 8.9). The price is approximately $2050 for the Windows XP Tablet PC version, and $2215 for the Vista Business edition. It appears to be shipping in Japan now, however no word on when it will become available elsewhere in the world.